I have just received notice of a full smith period which means that blight is now a real possibility. The best thing you can now do is spray your haulms with Dithane or Bordeux mix to protect your crops. Once you have blight there is no cure so prevention is the key. Try and spray at a time when the mixtures can be absorbed into the haulms and not be washed off by rain. Well the potatoes are growing well. We have now sprayed them twice for blight and the haulms are nice and healthy. 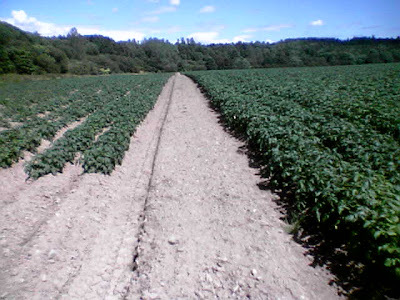 We are in desperate need of water because the potatoes are now beginning to form and too much heat will damage the skins and produce potatoes with scabs on. 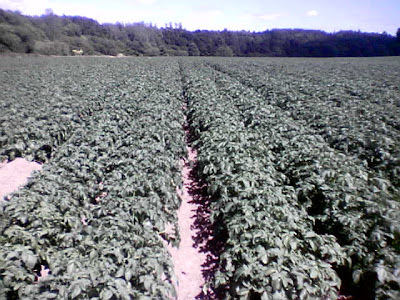 This will nit effect how the potatoes grow but spoils the look of them and leads to more waste.